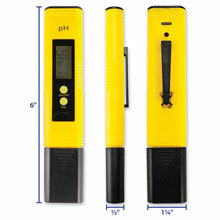 This digital PH testing pen is high quality and highly accurate for measuring range of 0-14 PH, 0.1 PH resolution, measure & display pH result simultaneously with LCD display, making it reliable and quick reading. Easy to, just remove the protective cap and immerse the PH meter electrode in the solution and turn on the PH by "ON / OFF" switch to be measured. So much easier than trying to see the colors of a litmus strip. Easy to calibrate, you can simply follow the instruction on the provided packet of solution 4.01 or 6.86, immerse the PH tester in the solution until numbers get stable. 2" wide, 1½" deep, 7" long. •WIDE USE: This pocket Size PH meter is the ideal test kit for home and laboratory uses. 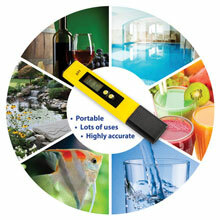 Ideal to test for ph in water, pools, aquariums, spas, hydroponics, food, wine and beer making and more. 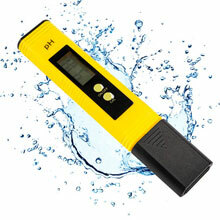 •FAST AND ACCURATE: Ensure your pool, general hydroponics ph or even drinking water has a perfect pH balance and safe for use with digital tester with precision pH accuracy. 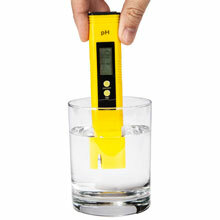 The tester has a sensitive electrode sensor to read accurate pH levels. The included detailed manual will show you how to get the best accurate and stable reading. •AUTOMATIC TEMPERATURE COMPENSATION: No more need to take care about the temperature of testing liquid, as ph meter has built in automatic temperature compensation, so that it can accurately determine pH value of the sample at any temperature in a range of 0°C - 80°C (32°F - 176°F). 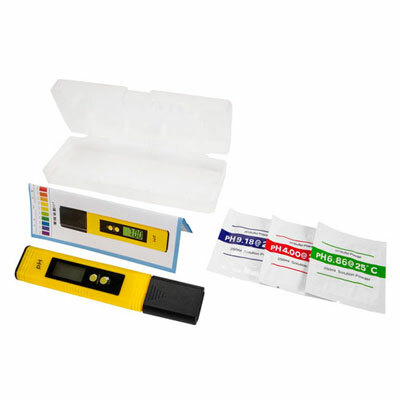 •AUTO CALIBRATION: The digital PH meter has an auto temperature compensation feature that adjusts to water temperatures and water quality to give pH readings almost instantly. As well, you can calibrate the tester with one touch button using buffer powder. 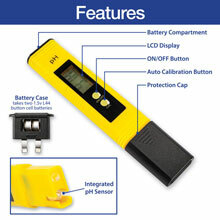 •DURABLE MATERIALS: A strong plastic case safety stores your PH meter until you need it next. The tester itself is made out of high quality electronics in a hard plastic shell, comes with 3 buffer powders to get you started right away. 2" wide, 1½" deep, 7" long.